I gave a reading, slide talk in Leipzig. You can't count on too many people coming to such an event. It is said that a favorite line at any poetry reading is, "And this is my last poem." Around 40 people actually showed up, however, with some even having to sit on the floor. They were students, academics, American expats and at least one man who had seen me on Iran's Press TV. Filmmaker Elisa Kotmair came down from Berlin. 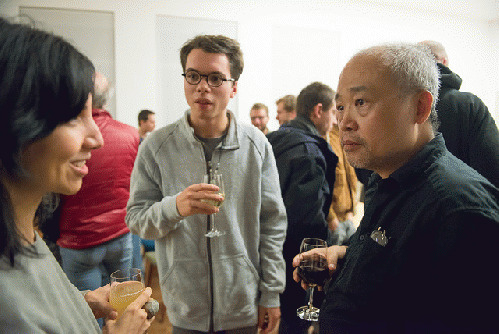 Afterwards, there was a wine reception, and among the people I talked to was Leo Jarzabek, a French student. Just twenty-one, he's traveled to nine countries and speaks English and German fluently. "Good enough to pick up girls!" Leo's also studying Chinese. Not majoring in anything yet, Leo is interested in the visual arts, literature, music and economics. "You're all over, man," I needled him. "Is economics your parents' idea?" "No, no, I'm really interested in economics." "But what is your love, really?" "You should stake your ground, man. You can become relevant by focusing on a place. A while ago, I was in Illinois. I didn't know where I was. I walked into a bar, and a guy told me I had to see Hugh Deneal. There was a show that night. I had never heard of Deneal, but he's huge in Southern Illinois because he writes about ordinary peoples' lives. He was good too. Maybe you should write about Leipzig?" "But I probably won't stay very long in Leipzig." Linh Dinh's Postcards from the End of America has just been published by Seven Stories Press. Tracking our deteriorating socialscape, he maintains a photo blog. Cui Bono After Orlando Pulse Club Shooting?